Pyongyang, April 13: North Korean leader Kim Jong-un on Saturday expressed willingness to hold a third summit with the United States, provided Washington offers a "fair" and "mutually acceptable" deal. He also said that the last failed summit in Hanoi created "strong doubt" over his decision to hold talks with US President Donald Trump. "If the US proposes holding a third North Korea-US summit with a right attitude and a right method, we have a wiliness to do it one more time," Kim was quoted by Yonhap News Agency, as saying. 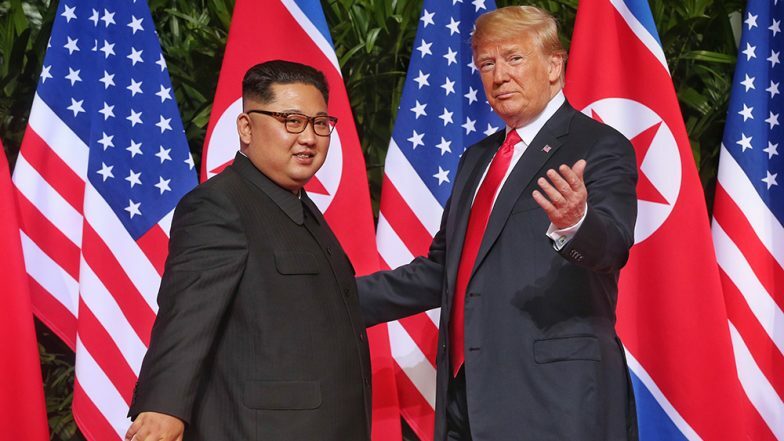 "I will not hesitate in signing an agreement only if it is written in a way that meets the interests of the DPRK and the US, and is fair, mutually acceptable, and this will entirely depend upon with what attitude and calculus the US would come up with," he added. Kim Jong Un Says He's Open to Another Summit with Trump. Meanwhile, Korean Central News Agency said Kim's remarks signalled that Pyongyang has rejected Washington's so-called "big deal" in return of dismantling all nuclear programs. Kim also asserted that Washington is required to take a "courageous step" to end the stalemate of talks. The remarks coincided with South Korean President Moon Jae-in's state visit to the US to hold talks with Trump for discussing stalled diplomatic talks between Washington and Pyongyang. During the meeting with Moon, Trump had asserted that he wanted to retain the sanctions imposed on North Korea while he worked towards getting the denuclearisation talks back on track with Kim. It is widely speculated that Moon is expected to participate in the proposed third US-North Korea summit, in order to keep the denuclearisation talks on track and to chalk out a peace deal to end the over six-decades-long Korean War. Trump has also asked his South Korean counterpart to help facilitate future dialogues with Kim. North Korea sought partial relief in sanctions at the summit in Vietnam, according to Pyongyang's Foreign Minister Ri Yong Ho. The US, however, held its ground and said sanctions will be eased only when complete denuclearisation is achieved.